Research over the past 20 years has consistently shown chiropractic treatment, without the use of drugs or surgery, to be up to twice as effective as medicine and physiotherapy for back pain relief. 85% of people suffer back pain at some stage in their life. Injury may occur from acute trauma such as a car accident or fall. In many instances, it is the result of months or years of accumulated stress from poor posture, work habits, lack of fitness and flexibility, and faulty joint mechanics. A spinal problem is commonly blamed on muscles, however more often it irritates the nerves. Therefore, pain, numbness, pins and needles or weakness may be felt anywhere in the body, eg legs. Back pain is the second most common reason for visits to the doctor’s office. 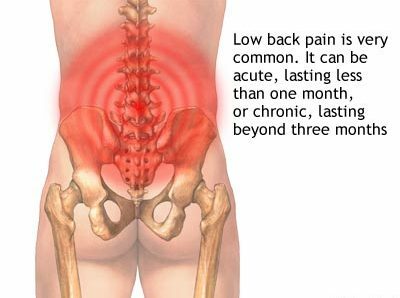 As long as it is healthy and functioning correctly, the low back can withstand tremendous forces without injury. However, if the low back is out of alignment or has weakened supporting muscles, then something as simple as taking a bag of groceries out of the boot of their car, picking something up off the floor, or even simply bending down to pat the cat can cause a low back injury. Until recently, researchers believed that back pain would heal on its own. We have learned, however, that this is not true. Recent studies showed that when back pain is not treated, it may go away temporarily, but will most likely return. It is important to take low back pain seriously and seek professional Chiropractic care. This is especially true with pain that re-occurs over and over again. Contact our Chiropractor . . . we can help! The Chiropractor will take a history of your condition, and then perform a thorough examination to assess your condition in order to provide lower back pain relief. If Chiropractic treatment is considered appropriate, a course of treatments will be recommended. Other treatments such as muscle relaxants, pain killers and bed rest, only serve to decrease the symptoms of the problem and do not correct the problem itself. is the key to decreasing the stress on your spine, by having good habits. POSTURE: Good balance is the primary objective, with the body relaxed when standing, sitting, lying or walking. When working change positions regularly. Take stretch breaks and ensure that your work area suits your needs. EXERCISE: Regular exercise and stretching is essential for flexibility and strength. LIFTING: Use your legs to lift. Keep your back straight with the weight close to your body and have your feet well apart. Do not twist when lifting. MAINTAIN OPTIMAL BODY WEIGHT: Being overweight increases strain on your spine, and changes your centre of gravity, therefore your body working more inefficiently. SLEEPING: Use a good quality and supportive mattress and pillow. Change your pillow yearly. DO NOT sleep on your stomach. Call now, and start to get rid of your pain or stiffness.